Well done! Kudos to you. You have just set up your Ecwid storefront, and you are watching traffic start to pour in. Or maybe you’ve just heard of Ecwid and you would like to give it a try. Either way, know that Ecwid is much more than meets the eye. You can now leverage the power of affiliate marketing to promote your store further, and create strong partnerships in your niche. All using the Ecwid platform. You can easily set up an affiliate program for your Ecwid store and start building up strategic partnerships in order to boost your brand, increase your sales and skyrocket your brand’s awareness among potential customers. With affiliate marketing, you can finally see the dream of passive income come true. You get to enjoy revenue sharing with other people who are willing to promote your products listed on your Ecwid store. This whole system works amazingly well for both startups and SMBs. Don’t have Ecwid yet? Click on the button below to get started for free. In this guide, we will dive deep into affiliate marketing and how to find affiliates for your Ecwid Store. But first things first. Let’s take a closer look at what affiliate marketing really is and how it could help you skyrocket your business. Affiliate marketing is the process through which promoters earn a commission by advertising products or services of a company. In your case, you are the company, and you are working with affiliates or promoters who earn a commission from you for each sale they bring to you. They are advertising your products on their blogs, social media channels, and on other channels. If they truly believe in your products, you might become a prime choice for affiliate looking for strong partnerships. This is a win-win situation. You are getting more traffic and sales, while the affiliates get a percent of each sale. There are 3 main parties involved in the affiliate marketing process: the publisher, the advertiser and the consumer. As the publisher, merchant or seller, you are the one who owns the products. You don’t need to actively sell your products to benefit of affiliate marketing. You just need to have a good product to sell and to work with several affiliates. With affiliate marketing, you can focus solely on finding affiliates that would promote your products. Thus, you are only left with managing your store, SEO growth and streamlining the processes. Why is Affiliate Marketing Important in 2019? By leveraging the power of affiliate marketing programs, you are able to dramatically extend your reach and sell your products to a wider audience than ever before. You will be able to promote your products using the personal, already-established marketing channels of your affiliates. Whether you are a startup who just started selling online, or you already have a well-established brand and you have moved to a paid Ecwid plan, you want to use affiliate marketing to monetize your eCommerce platform and send more visitors to your store. Basically, your affiliates will post links on their sites and platforms, links that direct customers to buy from your site. Each link contains a unique tracking code that is specific to each affiliate. In case you make a sale, the respective affiliate who sent you that customer will get a certain percent from your sale. Affiliate marketing is key for businesses that want to prosper in 2019. As a rule of thumb, affiliate marketing draws in much more profit that you would expect. A common saying is: if you want to go far, go with friends. You can empower your sales force, or affiliates, to become your biggest fans and spread the word about your unique products. As you can notice, affiliate marketing is the real deal. You get to enjoy only benefits and no drawbacks by using an affiliate program. Keep in mind that the traffic you get to your site is pre-qualified by your affiliates, so it converts much better than paid traffic. Usually, it has the same conversion rate as organic traffic, which is quite amazing. The great thing about Ecwid is that it allows you to install your site on numerous platforms at once. This means that you can also share the Ecwid integration code with your affiliates. In addition to setting up your store on several platforms you own, you can share the code so that your affiliates can place your Ecwid store on their platforms. This method of embedding the code into a website or blog is super easy, and takes limited coding skills. In simple terms, the process works like this: you give your affiliates the code, they place it on their sites, and you use a common 3rd party tracking system in order to track all orders placed from their sites. To save time and money, you could also just provide them with the tracking code and a coupon code. Another method you can use to set up affiliate marketing right in your Ecwid store is to do it the classic way. Use a 3rd party system, offer your affiliates banners and let them place the banners on their platforms. If a customer came from one of their banners and made a purchase, the 3rd party affiliate system will attribute the sales to them. If you need banners to be made for you, you can easily have them done at a low cost on Fiverr. Ecwid integrates with numerous top-notch affiliate apps available on the market. Three of the best are Lead Dyno, Post Affiliate Pro and Affiliatly. Lead Dyno is a modern, user friendly 3rd party affiliate system that allows you to create your own affiliate programs with just a few clicks, recruit affiliates with ease from a vast network of bloggers and influencers, and also help you share your affiliate program via the mobile app. This tool leverages the power of mobile to help you stay in control of all affiliate processes and automate payments. Each affiliate has its own dashboard and can communicate with you in real time. You also gain access to multiple networks and useful tools for sharing your products. This advanced affiliate software offers you quick integration with your affiliates via banners or via your Ecwid code. Want to learn how to setup Ecwid eCommerce and generate more sales today? 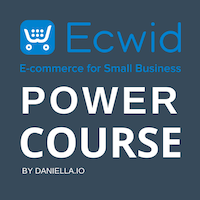 Click on the link below to learn about my Ecwid eCommerce Power Course. Affiliatly is an advanced system similar to Lead Dyno, that comes with advanced features and tools. You can choose from various tracking methods, including QR codes, emails or product SKUs. You get to enjoy unlimited orders and work with a plethora of affiliates. In terms of features and utility, Lead Dyno is the best out of these three Ecwid affiliate marketing apps. However, note that Lead Dyno is also the most expensive. Now that you have decided to leverage the power of affiliate marketing and you know how to easily integrate it into your Ecwid store, it is time to think of how you can find affiliates for your store. There is not a wrong or a good way of finding affiliates. You just need to try several methods and see which one works best for you. Ultimately, remember that you are the one who is offering this money-making opportunity, so you’ll find your affiliates in the end. The trick is to find the most capable affiliates with a similar target market that will also be able to bring you a profit. Below are 10 unique methods you can use in 2019 to find affiliates for your Ecwid store. One of the top features in Lead Dyno affiliate marketing software is that you gain access to an internal network of affiliates and influencers who can get you going. There are thousands of affiliates that work on this platform and are actively looking for products to promote. As a Lead Dyno merchant, you will gain free access to E-CommerceAffiliates.com, a large network of influencers and affiliates. If you choose to go with another affiliate marketing software than Lead Dyno, you should not give up the idea of affiliate networks. There are many well-established affiliate networks out there, such as Clickbank, Amazon, CJ or TopOffers. You can choose your favorite, simply create your account as a merchant and use the internal tools to find affiliates eager to promote your products. Another thing you can do is to try to establish connections directly with website owners. Look for blog owners and website owners that rank very well in Google and give them an offer they cannot refuse. You might be willing to offer them a higher percentage of the sales, or create a customized incentive plan. You have nothing to lose by contacting as many people as possible. Many bloggers make a living by promoting high-end products. If you have something quite unique to sell, and if you convince a blogger than it is worth advertising your products, you’ve just gained yourself a huge fan. That’s one fan that will bring you clients and money in the long run. Another exceptional way to find affiliates for your Ecwid store is to leverage the power of Facebook groups. Social media has dramatically changed the way we do marketing. It has become the ideal medium for advertising new products, but it’s also amazing at finding collaborators. Use the free tool of Facebook called Groups to find just the right affiliates for your business. Another thing you can do is to find out what your competitors are doing in terms of affiliate marketing. Who is selling your competitors’ products? How are they doing it? To do that, reach out to affiliates, find out who they work for and offer them a better deal. Provide a better commission rate than what your competitors are offering, plus get them some bonus offers to incentivize them to work for you. If you are already in an over-saturated niche, do not hesitate to start slower in order to establish yourself as a powerful brand. Offer better commissions than the market average, but do not forget that you also need to make some money in order to scale up your business. Strike a balance between the two and leverage the true power of affiliate marketing. Quora is an amazing social media channel for gaining access to valuable information. Ask your questions there, make strong connections and be 100 percent positive that you will get precious names, contact information and ideas on how to find the best affiliates in your niche. Instagram has grown to become the #1 platform for influencers. Of course, LinkedIn is also in the mix, but on Instagram you will quickly find out who the best influencers are. Connect with them, send each of them a personalized message and reap the benefits of your efforts. Finally, find new affiliates for your Ecwid eCommerce business by testing the waters. Do not be afraid to try something bold, something no one else has tried before. Think out of the box and prove your persuasion abilities by finding the right affiliates eager to promote your products. Thanks to Ecwid affiliate marketing, you will be able to generate a huge amount of sales that will enable both your partners and yourself to be happy and content with what you have accomplished together. This is the true power of affiliate marketing. Both Wix and WordPress are popular site builders, and Ecwid users can use either of these options to create their business-oriented sites. However, despite being in the same niche, there is still a world of difference between WordPress and Wix. But what are these differences? More importantly, which site builder is the better option for you as an Ecwid user? Take the personalized quiz and find out! Ecwid eCommerce supports over 50 payment processors from a variety of countries. Learn what providers Ecwid supports and how to set them up in this article. My Mission is to Help You Start & Grow Your Online Business with Ecwid. 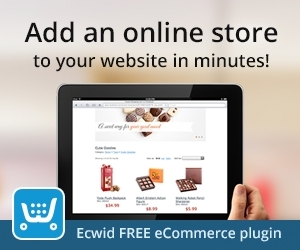 Save time searching for codes in the Ecwid forums and support site! Everything you need is all in one place in this eBook. 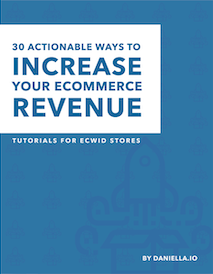 Ecwid is full of hidden features that can help you increase your store’s revenue and save you time. Are you using them to their full potential?